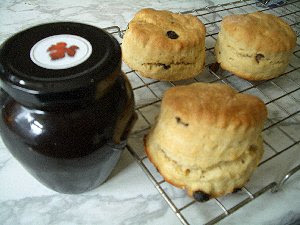 Scones are a Sunday treat here at Pinotage Towers. And what better topping than Pinotage jam? I find it strange that grape jam is not more common. I am not aware of any being available in the UK. In South Africa you can buy Hanepoot jam, made from those large golden intensely sweet Muscat grapes used for making dessert wines. Ripe Pinotage grapes are also quite sweet, and this jam comes from Beyerskloof Winery. 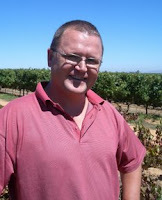 Owner Beyers Truter has been incorporating Pinotage in many foods, sausages, ice-cream, yoghurts, meat sauces etc. See Red Leaf and Green Pinotage. So, what is it like? On opening it has a lumpy texture from the berries and a dark, browny black colour which doesn't look too appetising. The nose is not sweet like other jams -- ahh I get it! Some wines we call 'jammy', and this jam is definitely 'winey'. Spread on the opened scone -- broken open where the side of the rising scone has fractured -- take a quick photo (see picture right) and take a bite. Umm, tastes good. There is a winery grapiness, it is not overly sweet. Definitely an adult jam, and I am thinking that it maybe good as an accompanient to savoury dishes, such as bobotie or with turkey instead of red-currant sauce. 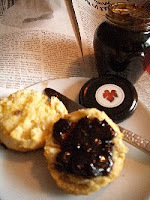 Unfortunately Pinotage jam is currently available only from the winery, but scones are easy and quick to make. 1. Heat the oven to 200C/400F/Gas 6. Lightly grease a baking sheet. 2. Mix together the flour and salt and rub in the butter to get a bread crumb-like texture. 3. Sprinkle in the sultanas and stir them through, there should be plenty so add more if you want as they are the only sweetening* in the scones. 6. Gently roll out to 2.5cm/1in thick – making them too thin is the biggest cause of disappointment. 7. Use a 5cm/2in cutter to stamp out rounds and place on a baking sheet. Knead remaining dough, roll out and stamp out more scones till all used. Cutting the edges helps the dough rise. 8. . Bake for 20-25 minutes until well risen and top is firm. 9. Place on a wire rack and serve with butter and good jam and cream to taste. 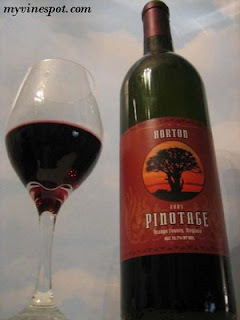 I reported in December (see here) that Horton Vineyards in Virginia USA was going to release a varietal Pinotage in 2007. I am indebted to Dezel of Virginia Wine Spot for permission to quote from his tasting notes for this wine, and the use of his photo of the bottle. "The wine is accessible and done in a fruit forward style displaying a brilliant deep ruby color. On the nose are enticing red berry fruit aromas, mild spice and soft cocoa hints. The aromas follow through on the palate with an abundance of upfront fresh red berry fruit flavors, namely raspberry. Well balanced and substantial, 17% of Tannat is added and provides a solid tannic structure that comes across on the taste as velvety. This wine for me is of an easy drinking, fresh fruit style that is thinly framed in soft spicy oak with a medium length finish. In closing friends, this is a nicely made wine, however not the rustic, bramble berry and smoky characteristics found in quintessential South African Pinotage. 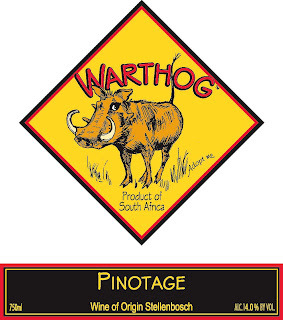 Perhaps Pinotage is indeed suited to its native South African terrior to capture its true expressionism. But, lets not be fooled, this Virginia Pinotage is a very good wine that I recommend readers seek out. This is a rare find in Virginia and exemplifies what the grape can do in Virginia’s soil and climate. 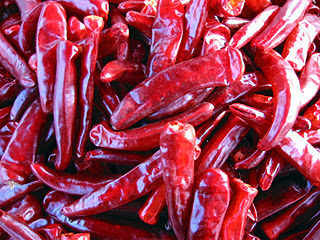 Try this on its own or with red meat dishes, spicy foods and even traditional barbecue." Thanks Dezel. I look forward to being able to taste the wine myself. Vinappris currently list the following Pinotages - False Bay 2006 (£7) Spier Private Collection 2004 (£15) Keerweder Estate 2003 (£17) and Graham Beck Old Road 2001 (£19). The shows are professionally put together, cutting between studio presenters tasting and talking about the wines and filmed inserts from vineyards and wineries around the world. "South Africa also holds an international attention seeker, pinotage, the indigenous grape variety to this picturesque country. Found nowhere else on earth it creates some fantastic well balanced reds. Pinotage is a cross between two different grape varieties, moulding and creating the best of both worlds. Pinot Noir and Sancerre, Pinot Noir offers the delicate flavours of red berry’s, strawberry, raspberry, an elegant wine which is beautifully complex. Sancerre offers body and strength and even a little spice. Combined, these two grape varieties move into new territory, creating a world class grape known as pinotage. " I cannot disagree with their conclusion, but can only repeat what I said here - its time to stop talking about Pinotages parentage -- even when you can get it correct. A 1970's rock group -- a heavy metal banana band -- that is what Gary Vaynerchuk of WineLibraryTV.com (pictured right) likened to Kanonkop 2004 Pinotage. For the first time in his vidcasts, he tasted four bottles of the same wine to experience the differences that opening times and decanting made. And the wine he chose was the same wine he raved about in yesterdays episode, Kanonkop 2004 Pinotage. Today he first tasted the bottle he'd opened 24 hours earlier which he has used in the previous tasting. Then he compared two Kanonkop 2004's that he had opened 5 hours previously; one had been decanted while the other had been left in the bottle. The fourth was opened on camera and tasted immediately. To find out what he discovered, sit back and let Gary's enthusiasm take you away. 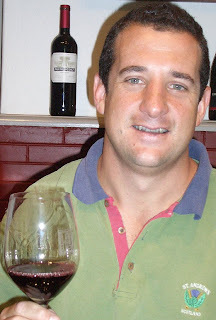 Gary Vaynerchuk (pictured right) of WineLibraryTV.com isn’t a big Pinotage fan, but he says of Kanonkop Pinotage 2004 "This wine is rocking". In his 218th on-line video tasting 'vidcast', first shown on 17 April, he features South Africa, with two whites and two reds including the Kanonkop. Gary says of it "Dark colour. Hint of banana on nose (really cool!) surrounded by amount of rusty old beer cans, rusty nail, rusty aluminium. Nose now getting really outrageous tremendous banana. This is a clean cut, polished Pinotage. I like this wine, beautiful red cabbage profile, oil & vinegar & olives. Bananas are jumping, (I Iove bananas, structured like Bordeaux, terroir driven, this is essential class Pinotage. Comes from granite soil, you’re getting some of this. Its really polished, but young, need another three years. Now getting dark liquorice flavour, gets olive & smoky on finish. I highly recommend it, I’m giving it 91 points. If you like extremely well polished and intriguing wines, seek this bottle out. Rustenberg John X Merriman 2003 - corked. I very rarely have the problem of left-over-wine. But I am frequently asked by others what to do with wine left in the bottle. My usual answer is to stick the cork back in the bottle and keep the bottle upright in the fridge door. It’ll be OK for a day or so, and for some red wines maybe longer. However I took the opportunity this trip to the Cape to experiment with freezing wine. I was ordering a bottle of wine at lunch, consuming a glass or so, and taking the bottle with me. But by dinner time I frequently had another ‘must open’ bottle. 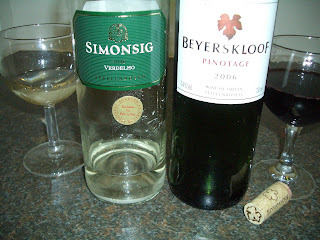 First was a white wine, Simonsig 2006 Verdelho*. When I opened its spiffy screwcap the wine went cloudy. I left it for a while to clear. The photo (below right) clearly shows the white powdery deposits of tartaric crystals, brought out of solution by the cold. Many mass market wineries practise ‘cold stabilisation’ where they chill wines to precipitate these crystals so that they will not appear after sale as many casual wine drinkers mistake them for glass fragments and return the wine to the shop. However this chilling also removes something of the flavour, and is frequently not done on better wines. And so it proved here. The wine was quite acceptable and drinkable, but it wasn’t quite as crisp, racy and exciting as I remembered from when I first opened it. 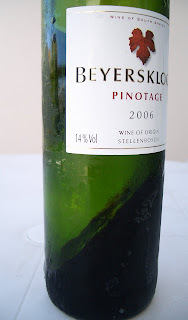 The Beyerskloof Pinotage 2006 was also most drinkable, and showed little change, maybe just slightly dulled. But freezing hadn’t destroyed the wines. Now you might argue that these were quite gutsy wines, especially the Pinotage with lots of upfront flavours. Would a delicate wine, such as a mature Mouton-Rothschild survive such treatment? All I can say is that I am willing to do the experiment if someone will supply the wine. So if you have opened wines you want to keep – try freezing them. 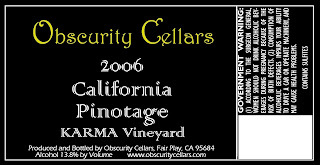 Pinotage is one of the wines made by Obscurity Cellars at the memorable address Slug Gulch Road, Fair Play, California. Owner winemaker John Smith says “Pinotage is, like many of our offerings, one of the most obscure grapes in California. It originated in South Africa … and has been known to produce anything from a violet-infused light-bodied wine to a heavier wine with flavors of earth and mushrooms. This version has ripe, almost ethereal aromas, with an extremely fruity, yet complex combination of flavors in the mouth. Since this is our first version of this wine, we don't have much experience pairing it, but we think it will be ideally suited to prosciutto-wrapped figs, and other complex, fruit-rich snacks or main dishes." The grapes from that initial 2003 vintage wine came from California’s largest Pinotage vineyard; John Bree’s Sutter Ridge Vineyard in Amador County. I visited John in 2002 and tasted his own excellent Sutter Ridge Estate Pinotage. But John Smith tells me "John Bree, after years of pleading with people to take his Pinotage grapes, sold his entire crop early last year, and couldn't supply me any. Instead, the good folks at Vino Con Brio sold me two tons from their KARMA Vineyard (the name is an acronym of all the Matson family members' first names)" for the Obscurity 2006 vintage. John Smith says to look out for "Obscurity Dolcetto this summer (only 25 cases made) and Carmenere in the near future. We also did a Malbec Rose this year, and we think it's the first one in North America." 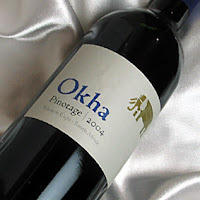 Another obscure Pinotage is Okha (right) which has been sold in Japan for at least four years. I’m guessing it is a shippers brand: does anyone know anything about it? "It's a country where the magnificent scenery is matched by terrific wines", states Tesco in its March Wine Club Magazine. 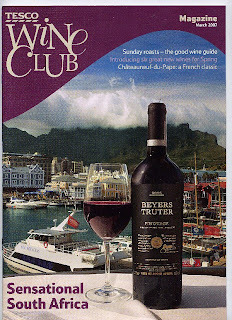 And which wine is dominating the cover but Beyers Truter's Pinotage. It has a cracking classy label that would grace any table. It's in Tesco's 'Finest' range, and -- since they already stock Beyerskloof standard Pinotage -- I guess this is a relabelled Beyerskloof Reserve. It is priced at £7.99, two pounds more than the standard Beyerskloof. Graham Nash writes in the magazine "Some would say that a country that first planted vines in the 1650s, and whose wines were favourites of Napoleon and Jane Austen, hardly qualifies as ‘New World’. However, it’s only in the post-apartheid era that South Africa has again begun to make an impression on our palates. As in sports such as rugby and cricket, it’s taken a while to make an impact, but the wines since then have improved beyond recognition. "Many of the grapes grown are familiar. Cabernet Sauvignon and Chardonnay were the first to become popular, but the fashionable grapes at the moment are Shiraz and Sauvignon Blanc. 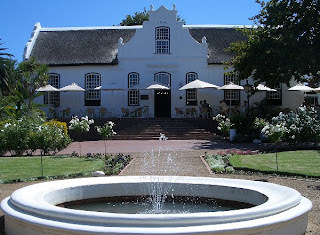 The style of both – as with many South African wines – sits at a very attractive halfway house between the exuberant fruitiness of the New World and the elegance of the Old. 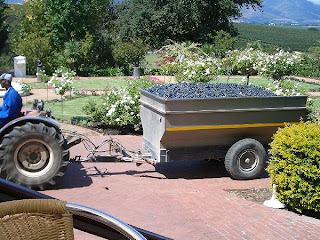 There is also some very good Pinot Noir being made, especially in the country’s cooler areas. But the country does have two points of difference, in the shape of Pinotage and Chenin Blanc. "Pinotage produces wines with lively flavours of wild berry fruit, occasionally spiced up with hints of banana and toasted marshmallows. You’ll find full and light-bodied reds, and surprisingly good rosés, ranging from good value wines to some that are amongst the finest in the country. W"hatever food you’re planning, you won’t have trouble finding a South African wine to match it. The local cuisine sees the influence of several cultures – European, Indian, African and Indonesian – combined to extremely tasty effect, and the refined yet flavourful wines are excellent accompaniments. And of course there’s the braai, South Africa’s super-sized version of a barbecue. Forget formal dining. Simply charge your glass with Pinotage, gaze up at the starlit sky and enjoy." I want that classy black label Beyers Truter Pinotage, but sadly it hasn't yet appeared in my local Tesco stores. Martin Meinert is caught on video in mid-harvest. He is making Pinotage and trying to avoid funkiness. In the second part, Martin discussed some of the challenges Pinotage presents, including excess malic acids, and how he tackles them. If the images above from YouTube fail to appear, the videos can also be seen by clicking here for Part 1 and here for Part 2. 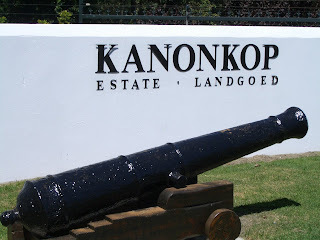 Kanonkop Estate has been making Estate wine since 1973, and in that time there have been only four winemakers, Jannie Krige and famed rugby player Jan “Boland” Coetzee (now at Vriesenhof), then Beyers Truter (now at Beyerskloof) from 1980, and currrently Abrie Beeslaar took over the reins in in 2002. 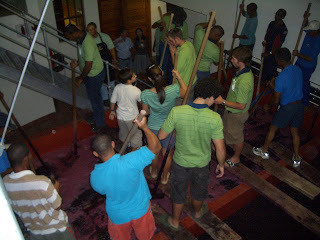 The owners are Johann and Paul Krige, the fourth generation at this family owned wine farm. 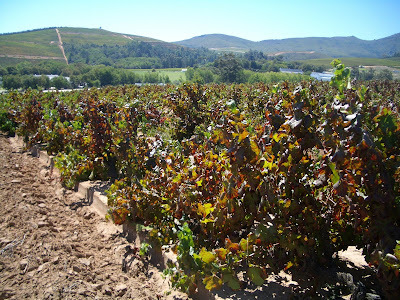 Kanonkop were pioneers in planting Pinotage and their old Pinotage vineyard (pictured below) still contains many of the original vines. This is just starting malolactic fermentation so it’s way too early to form any judgement, but it has intense colour and bubblegum flavours and very interesting to sample it on its path from vineyard to eventual bottling. Many thanks to owners Johann & Paul Krige, Abrie Beeslaw and all the hardworking team at Kanonkop Estate for the opportunity to taste these wines and for a most enjoyable evening. Wine and food writer Fiona Beckett has tried matching a curries with various beverages, and recounts the experience on her Food & Wine Matching website in an article titled Can any Wine survive a Vindaloo? Armed with a "can of supermarket lager, a bottle of Greene King IPA (Indian Pale Ale), an Alsace Gewurztraminer, a full bodied, fruity red Stormhoek Pinotage from South Africa and a mango lassi - all served chilled, even the Pinotage" she started with a medium hot Chicken Rogan Josh, moving on to a supermarket vindaloo and finishing with a "vindaloo from the takeaway, which was hotter still. The Gewurztraminer really couldn’t cope with this unless you added some raita and dal but the Pinotage still kept going"
She concludes that "the big surprise - although I’d had an inkling it would work because South Africans regard it as the best match for curry - was the Pinotage, welcome news to those who prefer drinking red wine to white. But don’t drink it at room temperature, chill it first!" That Pinotage is a good match for spicy foods is no surprise to Pinotage lovers, but it is good to hear the word is spreading.